Arthritis of the knee is not uncommon: it is thought that 2% of people aged 55 and over living in the UK would benefit from knee replacement surgery. Whilst total hip replacement has revolutionised the treatment of hip arthritis there has up until relatively recently been a misperception that knee replacements are not as successful and as a result are not so commonly performed despite the fact that more individuals suffer with arthritis of the knee than of the hip. It is generally agreed by orthopaedic specialists that a total knee replacement is the treatment of choice in individuals suffering with severe pain and disability due to arthritis and we have witnessed a reversal in this trend over the past 10 years with more knee replacements now performed each year in this country than hip replacements. 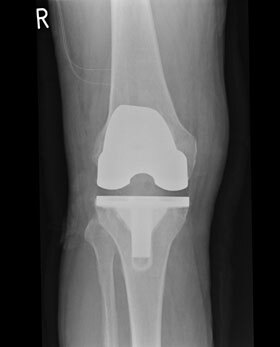 Indeed, a total knee replacement has been described as “the joint of the decade”. Much of the current interest in the treatment of knee arthritis relates to implants that allow for either more bend or rotation, computer assisted surgery and operations performed with smaller incisions. Surgeons will be viewing studies to assess the role of robotically assisted knee replacements with keen interest. Today, well over 90% of individuals can expect to enjoy a dramatic reduction in pain and a significant improvement in their ability to manage the routine activities of daily living following a knee replacement and as surgeons we would expect that approximately 90-95% of knee replacements will still be working well at least 15 years following surgery. Patients will often leave hospital within days of their operation. With good physiotherapy and hard work they can expect to be walking unaided and to return to driving within six weeks. A new knee will not however turn you into an athlete and allow you to take up those activities you could not manage before the arthritis developed. It has been said that a total knee replacement can add life to years if not years to life.